There’s one thing that I’d absolutely die for every morning: fluffy pancakes. The more fluffs the better. And when I talk pancakes, I mean the American pancakes, not the thin Swedish pancakes (pannkakor) that look exactly like crepes to me. This created confusion at home for us a few times. My bf asked me one day what would I want for breakfast and of course I happily asked for pancakes! Only when I came into the kitchen later, to my big surprise and *a bit* disappointment, he was making crepes instead. Since then, I made sure to clarify Amurrican pancakes every time we plan to have a pancake breakfast. As a pancake lover, I have small confession to make: I’ve never eaten my pancakes with maple syrup. I don’t even have maple syrup in my pantry. Does it sound like a crime? I prefer them with bacon. Fried, crispy bacon is my pancakes’ best friend. And some time in the past it’s a drizzle of condensed milk. Recently, I’m more into banana pancakes with Nutella and peanut butter. It feels so sinful and yet sooo good. I’ve made several attempts to make my banana pancakes as fluffy and airy as the normal ones and finally came to a recipe that I’m quite happy with . The tricks to an airy fluffy banana pancake are: 1) buttermilk, 2) firm beaten egg whites, 3) never skip the baking powder and 4) be patient and cook them slow at low heat. The last tip is extremely important because I learned it the hard way. Impatient as I am, several times I had ended up with deflated and uncooked-in-the-middle banana pancakes a few minutes out of the pan. So yeah, it does worth the wait guys. 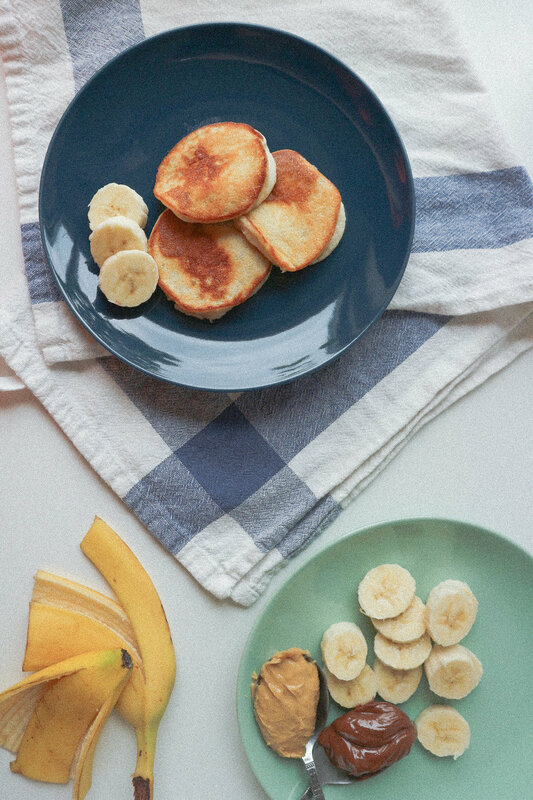 Be careful with these pancakes tho, once you perfected the art of banana pancakes, you might not want to go back to the traditional pancakes ever again. In one bowl, mash bananas then mix in egg yolks, vanilla extract, buttermilk and melted butter. Mix flour, baking powder and salt into the banana mixture. Let rest for 10 mins. In a separate bowl, beat egg whites with sugar to firm peaks. Be careful not to overbeat the egg whites. Gently fold the beaten egg whites into the banana batter. Don't do it all at once, a quarter of the whites at a time is good. Lightly oil a heated pan at low medium heat. Drop the batter into the pan according to your desired size, I personally find small size works best since they're cute and easier to flip. Cook until the surface forms bubbles and starts to set, be patient as it takes some time. If you want extra tall and fluffy pancakes, this is the time to put a tad more batter on top of the cooking pancakes. Flip and cook until the other side is golden brown. Serve when warmn with Nutella and peanut butter or any of your favorite toppings! Update on post-Halloween Netflix and chill: I’ve finished both Sabrina and The Haunting of Hill House. In fact, I spent the whole Halloween night binging on Hill House and loved every second of it. Both series were thrilling in their own ways, but Hill House was definitely on a different level. As much as I like the story telling and the character development in Hill House, it really had me convinced that apartment life is the one for me. I definitely never want to live in a big old house. Ever. Especially those with creepy basements and attics. I’m a tiny girl and I don’t need a lot of space. I mean how the hell do you know who had lived and died there when you buy a house that is not newly built?? Scary as it is but go watch it if you haven’t peeps. Talk about fluffs, we welcomed this big fluffy guy home yesterday. We went to IKEA looking for pillows and got this instead. My defense: this fluff is so much better than a normal pillow for sure.